Guess I'm not done with the empty nest series...now black birds have invaded the nests. 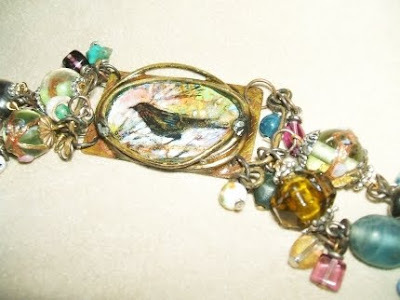 This bracelet is for sale on Moxie Gallery. 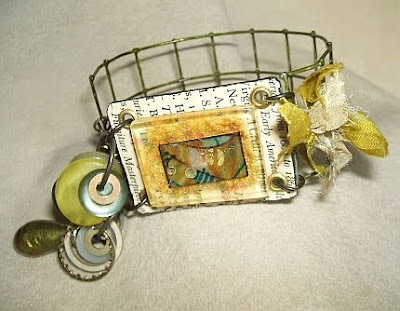 Another colorful lightweight cuff has been added to Moxie Gallery. Light and airy for summer. This color combination will go with just about anything. Check out the faux enamel bead. Detail photo of the bead here. Key Lime is the title of this wrist adornment... a new line of cuffs that will be up for sale on Moxie Gallery. 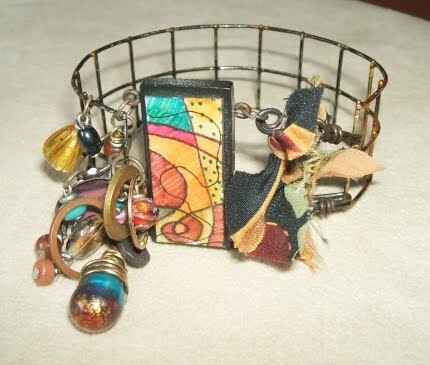 This cuff houses a tiny original abstract art piece nestled in faux enamel. Stained metal, buttons, washers, silk, and a hand crafted faux enamel bead, make this cuff fabulous, light, and airy for hot summer wear. PleaseDO NOT copy or publish. The above necklace has been featured in BEAD TRENDS magazine/booklet April 2011 issue. You will find photos and How To Instructions on pages 100 and 101. 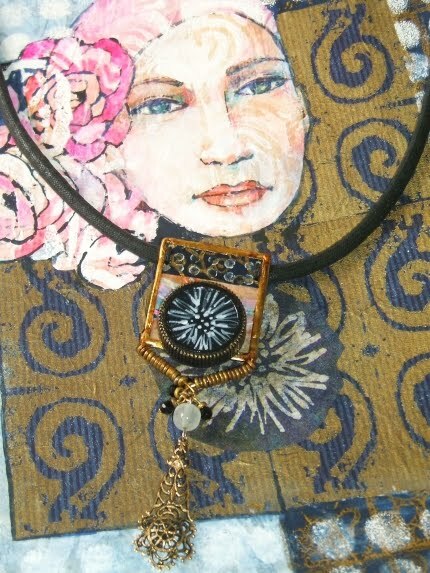 The necklace is made using all recycled materials, including old painted canvases and recycled denim jeans. To the left of the photo is a tiny peek of a purse that I made to go with it. 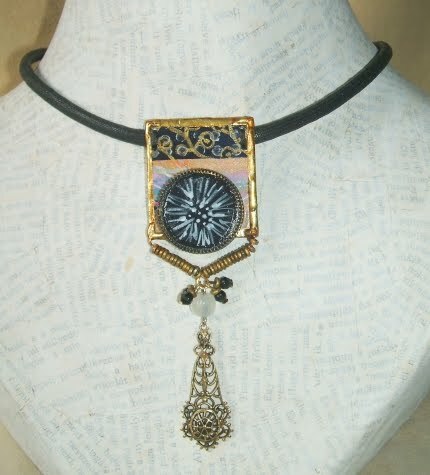 Another view of the necklace here. Sorry, (no I'm not) the purse is sold. Art Unraveled is just around the corner and I will be teaching a class on how to paint portraits in watercolor for beginners. The name of the class is About Face, and the sample can be viewed HERE. Once the technique is learned you will be able to go beyond that simple painting. You can use the drawing and the technique as inspiration to take it further into mixed media collage and jewelry making. The above mixed media painting was inspired by the class sample, and the necklace was inspired by the mixed media painting. If you are attending the class, I will give you all the information on how I take a simple piece of art, and take it beyond. See you at Art Unraveled. 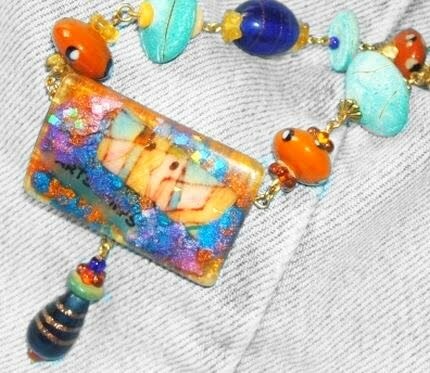 Visit my other blog, CLICK HERE to see photos of my entry for the Art Bead Scene Challenge. A big THANK YOU to each of you who have taken the time to visit and leave such nice comments. The Bead Soup hop is far from over...I'm close to the half way mark. I am trying to touch base with each of you, though I have run into a couple of blogs that are private. I thank those of you who have emailed me private and those who have become followers. A big hug to all of you. 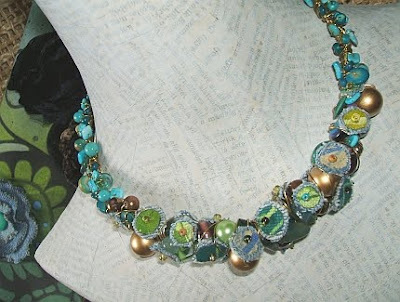 Please scroll down to view the finished Bead Soup necklace.